How much do you know about the mythical “Troll”? Have you read the stories/fairytales? Or do you simply know it as a title for idiots on the internet still living in their parents’ basement? Either way, you’ll certainly learn a thing or two with Troll Hunter, a Norwegian, found footage fantasy which portrays trolls to be just that little bit more irritating and sadistic than the average keyboard warrior in chat rooms. Three students in Norway, Thomas, Johanna and Kalle, investigating a series of bear killings, take their camera and decide to film their findings and encounters with the locals. Upon their investigation, they see a mysterious man who’s seen at each site before an attack is made. So, off these students go to interview the mysterious man and ask him of his intentions, which of course, is not welcomed by the man himself, however one night when trailing him, they come across a large troll. Yes, you heard right, a troll, who attacks at any given moment. The man is revealed as a troll hunter and once Thomas is attacked, the students are more than curious. The footage found later shows that they tag along with the hunter in hopes of seeing what he does and a good look at the trolls themselves. Seeing as how these Trolls, from the get go aren’t exactly too friendly… things only get worse. As the film is not in English and set in Norway, there’s very little chance you’ll have heard of any of the cast, but here’s the title players anyway: Otto Jespersen as the Troll Hunter, Glenn Erland Tosterud as Thomas, Johanna Morck as Johanna and Thomas Alf Larsen as Kalle. 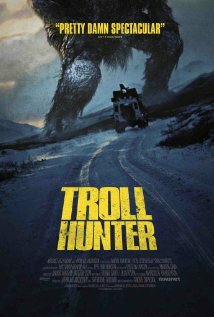 Ok, so it’s not exactly easy placing Troll Hunter in one category, yes it’s a found footage flick and yes it involves Trolls, but you couldn’t call it a flat out horror film, not even science fiction. There’s an air of fun to it all, and the film welcomes it. Some have referred to this as a comedy, and judging by a few scenes when the Troll Hunter discovers the actual troll, you can’t be denied in labelling that. It’s this inability to label it one genre that makes Troll Hunter a complete success of a movie. There’s a real hatred for Cloverfield and how serious it took itself and the fact that you barely see this unnamed creature. Whereas Troll Hunter is a little more self aware and you can see the trolls very clearly and they look ridiculous. Along with character reactions you’re almost welcomed in laughing at their appearance. It’s this embracing of its farfetched nature that’ll win audiences and make the experience all the more fun to endure. The only real complaints that can be made is that even at just over 90 minutes, it feels a little too long at times, the minute you get past what this hunter does and seeing the trolls themselves, the film loses some steam and the fun is few and far between… but it’s still very watchable and has a nice little ending to boot. You may also want to have a peek at these reviews: Aqua Unit Patrol Squad 1, Samurai Girls, The Expendables 2.